Do you want to know more? Would you like me to help? Sometimes another person's perspective - and experience - can be helpful. I worked for many years doing in-depth reviews and providing feedback - via reports, one to one sessions, in group meetings/workshops and by delivering presentations to large groups of people. Now I do the same thing - for artists. 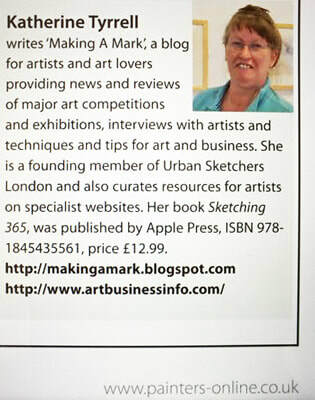 For many years just with the friends I have made in the art world - and now for a wider audience - hence this NEW page. OR reviewing an aspect of your art business e.g. 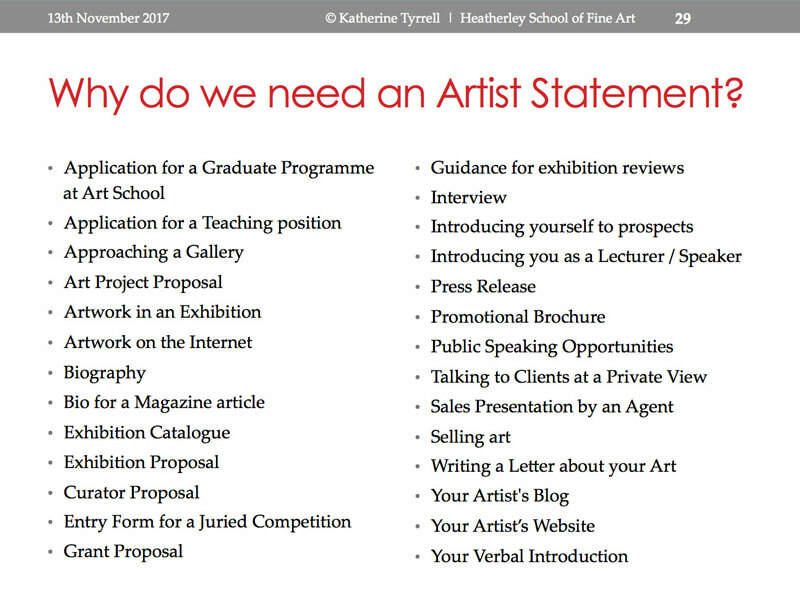 I have been periodically invited/commissioned to give talks to groups about art business matters. I'm a very experienced presenter/lecturer and am very used to talking to everything from very large groups of people (100+) to smaller groups. 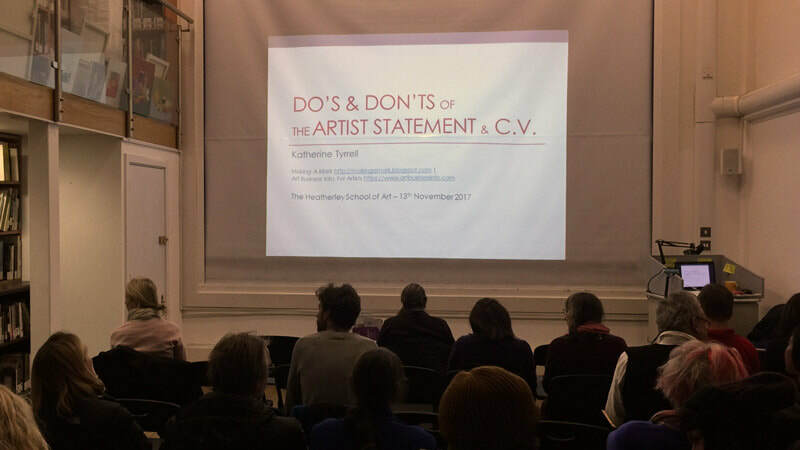 Do's and Don'ts When Writing an Artists Statement and C.V.
OR tell you what I can do for your budget. 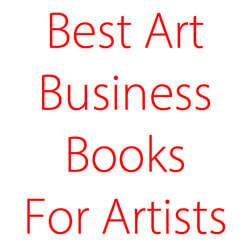 Would you like a review - of an aspect of your art business? I've provided informal business advice to artists for many years and have seen a number of them go on to achieve significant advancement in their careers as a result. If you'd like a review, we don't need to meet. this also helps keep the costs down for you. If you want to meet as well, this will take place in London. How you represent yourself and your art online. how you can improve how people view you as an artist. I've also looked at the websites and social media presence of a fair few art societies and can also advise on those. "Thank you for the care and attention you have put into preparing it for me. I really appreciate your honesty - it was a tough first read. However it was a definite call to action for me, a wake up call. I don't write it for you. I review, make suggestions and edit to indicate the potential to make your statement clearer. Fees depend on what's required and how successful you are. about? Honestly, I had no idea. confirmed that, yes, it was pretty awful, and then she helped me fix it. out problems in my writing style which I had not even noticed. At the end of the process I had a statement which clearly articulated both my method and artistic vision. And I can’t tell you what a relief it is to be able to send in a strong, well-written statement with an application and to no longer feel that twinge of embarrassment. I'm an experienced management consultant and can be commissioned (for a fee plus travel expenses) to review what you are doing at present and prepare a report and action plan for your art business planning and marketing going forward. This is based on developing a realistic set of goals with you and your current levels of knowledge and competence. I've been reviewing the open exhibitions of national art societies and the major art competitions exhibiting in London for over a decade. I can spot prizewinners and identify what sort of exhibition of competition is best suited to your art. I can also advise on why you may have been unsuccessful in the past. ....you gave me a very useful crit a few months ago. I absorbed a lot of what you said, and just wanted to share with you the news that both recent submissions to the Discerning Eye got accepted, plus I have just found that 2 new sculptures ....have got through the pre selection to the Threadneedle which has been massively encouraging. 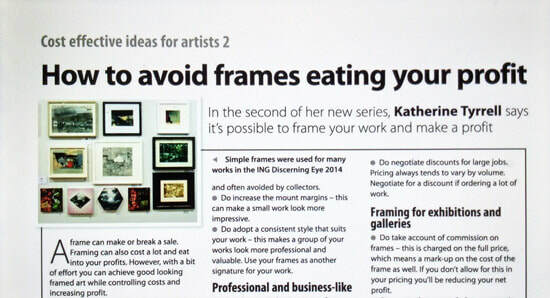 In 2016, "The Artist" magazine featured a commissioned series of 10 articles by me about Cost Effective Ideas for Artists. In 2015, my book of drawing and sketching tips (commissioned by Quarto / Apple) was published in the UK, USA and Asia - and had to be reprinted in the UK within 3 months. You initially send me an enquiry using the form below. how I will feedback (generally at the end of the review you receive a written report as a pdf file). what it will cost - including terms and conditions. I will warn you that my style is to be honest and direct. If you're somebody who only wants warm words of encouragement and nothing else then I may not be the right person to help you. However if you prefer a style which is honest and does not 'sugar coat' then I might be what you need. An awful lot less than my hourly charge-out rate used to be 20 years ago! My philosophy is to make my help affordable and yet at the same time charge at a level which means that only those who want to invest in themselves will approach me. I'm only interested in helping artists who are seriously interested in helping themselves. articles and/or books. Factors determining my fee relate to topic and timelines. I do some articles for free. whether I like your art! It might not be the normal way of doing business, but it works for me! I'm not in this for the money - I want to help people make a difference to their lives and careers. NOTE: This page and form relate to work involving the payment of a fee. This starts at £50 per hour for review work. Quotes for talks or workshops vary depending on length of session and amount of preparation for tailored talks. I always provide a quote and more details of how working with me before we make an agreement to proceed. you may well find the answer to what you need help with on this website for FREE.